This indoor/outdoor camera offers strong security monitoring in an easy-to-install package. 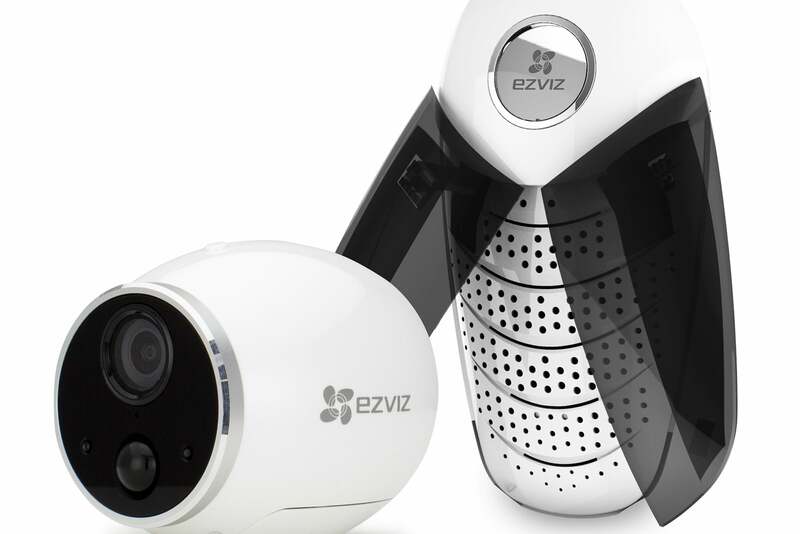 Ezviz, maker of one of the smallest and most affordable home security cameras available, introduced its first outdoor camera, the Ezviz Husky, earlier this year. We liked it, but it had the same drawback as most outdoor cameras: It required access to an electrical outlet, which for most folks means drilling a hole through a wall of your home to access an outlet inside, a nonstarter for many users, particularly renters. The Mini Trooper has two components: an unobtrusive egg-shaped camera that’s less than three-inches in height and length, and a scarab-like base station. The camera is rated IP65 for outdoor use—meaning it’s protected against dust and water jets—and can withstand temperatures of 14 degrees to 131 degrees F and up to 95 percent humidity, making it suitable for year-round use in all but the most extreme climates. The Ezviz Mini Trooper starter kit includes a camera, base station, and an 8GB microSD card for storing security video. The camera has a 116-degree wide-angle lens and streams and records video in 720p resolution. It supports motion detection, automatically recording video of triggering events and pushing alerts via the Ezviz companion app, and has a built-in mic to capture ambient audio (but no two-way communication). Night vision provides low-light illumination up to 25 feet. The Trooper also integrates with Amazon Alexa, allowing Echo Show users to access camera feeds with voice commands. Currently, the Ezviz doesn’t offer CloudPlay—its cloud storage subscription—for the Trooper. Instead, the base station, which can support up to six Trooper cameras, saves all recorded video to microSD card. Up to 128GB cards are supported. The Mini Trooper starter kit includes one base station, one camera, and an 8GB card. You can purchase additional Mini Trooper cameras separately for $110 each. 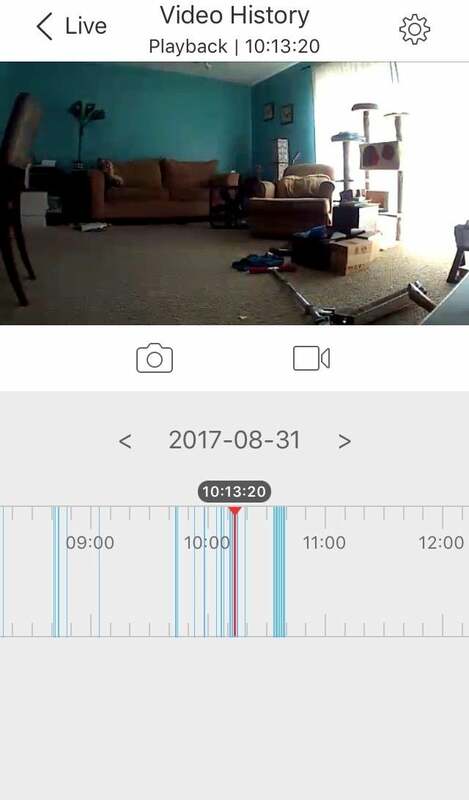 Ezviz camera setups have been pretty simple affairs in my experience. The Trooper process is more involved. After downloading the Ezviz mobile app and inserting the four supplied CR123A batteries in the camera, you need to plug the base station into an outlet and then plug it into your router via ethernet cable (one is included). You adjust the base station’s antennae by fanning them out like insect wings. 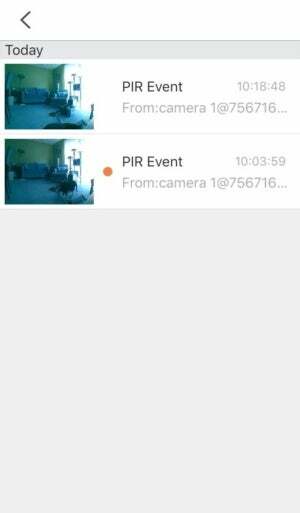 Motion-detected events are marking in blue on a timeline for easy access. Next, you have to pair the camera with the base station. With the two components within three feet of each other, you press sync buttons on both and wait for a flashing light pattern on the camera to prompt you to add the base station to the Ezviz app. At this point you’re asked to scan a QR code on the back of the base station with your phone—a head-scratcher since said base station is plugged in the wall to power this whole process. Fortunately, the same QR code is on the front cover of the base station’s quick-install guide. Once the base station is added, you’ll see you the camera on the home screen of the Ezviz app. At this point, you can connect the base station to your Wi-Fi if you don’t want it tethered to you router. It’s an extra step worth taking as the the camera needs to be placed within 300 feet of the base station to maintain a signal. Though the Trooper can be used indoors or outdoors, it’s bullet-cam design suggests the latter was a priority. The backside of the camera is magnetic and you attach it to a metallic ball-style mount, which you can affix to a wall with the enclosed screws. Alternately, you can attach the camera directly to any vertical metallic surface, like the side of a shed, though you won’t have the ability to adjust the viewing angle as you would on the mount. If you don’t want to, or can’t, mount it indoors, a flat patch on the underside of the camera body allows it to sit on a table or shelf. The Ezviz app interface for the Trooper is spare enough that even a novice should have no problem figuring out the controls. A toolbar beneath the streaming feed holds icons for turning the feed on and off, muting the audio, zooming in on the image (up to 8x digital magnification), and toggling to multi-camera view if you have more than one Trooper online. Beneath this are buttons for manually recording video or taking a screenshot of the feed. Along the bottom of the home screen is a horizontally scrolling timeline with motion-detected events displayed as blue lines. Tapping on one will load the recorded video clip of the triggering activity in the live-feed window. Thanks to its PIR sensor, the Mini Trooper’s motion detection is pretty spot on. The Trooper’s image quality is excellent in both day and night modes. The 116-degree field of view is perfect for monitoring an average-size living room, and there’s virtually no fisheye distortion. The Trooper uses a PIR (passive infrared) sensor to detect motion, so it only picks up moving objects radiating warmth. That keeps you from getting pestered with false alarms triggered by ceiling fans and other non-corporeal bodies. It was pretty sensitive in my tests, though, alerting me to every animal, domestic or wild, that passed in its field of view. I was able to reign in those notifications by using the app’s scheduling feature to automatically enable and disable alerts at specific times of day. Beyond that feature, there’s little in the way of customization for motion detection. You can disable alerts so you’re not bothered at all, but the Trooper doesn’t include motion zones or sensitivity calibration to control the frequency of alerts without cutting them off completely. The Mini Trooper delivers the same excellent security seen in Ezviz’s other cameras. Personally, I think it makes a better outdoor camera than an indoor one, but compromises should be expected with these hybrid models. 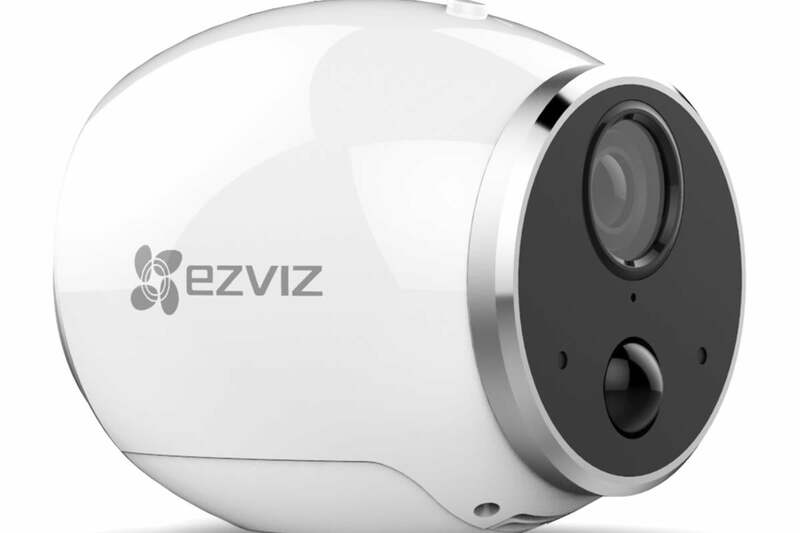 That said, if you’re really just looking for a camera to let you check in on kids, elderly parents, or pets inside your home when you’re away there are better-suited cameras for that job, including Ezviz’s own Mini Plus. If you want a more comprehensive, multi-camera solution to monitor in and around your home, then the Mini Trooper starter kit and a few extra cameras are a worthwhile—and affordable—investment. The Ezviz Mini Trooper provides simple security features in an easy-to-install package, particularly for outdoor use.